My overstuffed backpack had become getting heavy on my shoulders. After a week of travel across northern Germany, I’ve begun to collect things, and of course realized that I had packed poorly. Since leaving Bamberg I’ve acquired instant coffee, and oatmeal, and powdered creamer, a plattdeutsch book, a few more necessary toiletries. I need to weigh it before I leave. We hopped onto our 1hr and 30min long train ride to the Hamburg Hbf from Lubeck and day dreamingly cruised through the northern Germany countryside. Our new CouchSurfing host was waiting for us by Burger King in the train station. It’s strange, having to try and find a person in a busy train station based on pictures and not actually knowing what to look for. That is how CouchSurfing usually works. Our host looked right past us at first. “You cant miss us, the two girls with huge backpacks,” I had told him. I guess at a European train station, that’s a vague description. I found him first. The awkward, first meet moment ensued, the “um, I think you are the person I’m looking for?” moment. But there was Jan, in his leather jacket waiting anxiously for his two couch surfing girls. He was an environmentalist and a boat captain. Luckily as it was Sunday he had recommended we come before 2pm so that he could show us around. He really had fun taking us around some of the main sights of Hamburg in the sunny weather. I hadn’t realized previously that there was a ferry system as apart of the Hamburg regular transportation system. What a foreign concept, I thought. A ticket for the metro and buses includes ferry faire. We dropped our bags in the locker station and made our way to the Hafen (dock), to take a quick boat trip along the famous river Elbe. Which is the direct connection to the ocean. 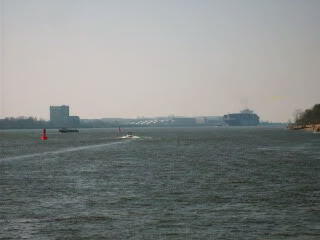 It is also how the big ocean liners get into the Hamburg docks to drop off their goods from all around the world. I stared at them longingly yesterday in Lübeck, wondering where they have been, what they’ve seen. The big ships really have a dark presence about them, hovering in a thick mist as they glide into the harbor following smaller ships, like airplanes being guided in from the runway. A lone siren blared in the distance and the seagulls screaming for food. Jan also took us to one of his favorite classic cafes in Hamburg, a café on the beach, where you really do sit in the sand and enjoy your coffees and cakes on plates on a beach. I opted for the beer and fish sandwich, my favorite northern Germany delicacy. I tried to eat as much fischbrötchen as possible on the trip and had at least one a day. The savory raw fish squished between a sort of mayonnaise sauce with lettuce and pressed between fresh bred was a Northerndelight and not something found below the northern Germany lines. 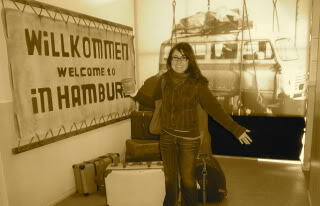 The Reeperbahn and other famous Hamburg attractions were to be saved for another day, without our generous CouchSurfing host.